I had such a good time at the Beaver Creek XTERRA two weeks ago that I somehow convinced Ian to drive back to Utah for the XTERRA Mountain Championships in Snowbasin (where I won the Winter XTERRA Worlds) last weekend. We arrived in Ogden on Friday afternoon after driving the seven-hour slog scenic route north through some of Colorado and Utah’s lesser known hotspots like Rangely, Dinosaur, Vernal and Roosevelt. How come Rangely never makes any of those magazine ‘best places to live’ lists like Carbondale just did? But I digress. In a flashback to last March, we again stayed with Micheal and Jenny Tobin at Jenny’s parents’ timeshare condo near Powder Mountain. 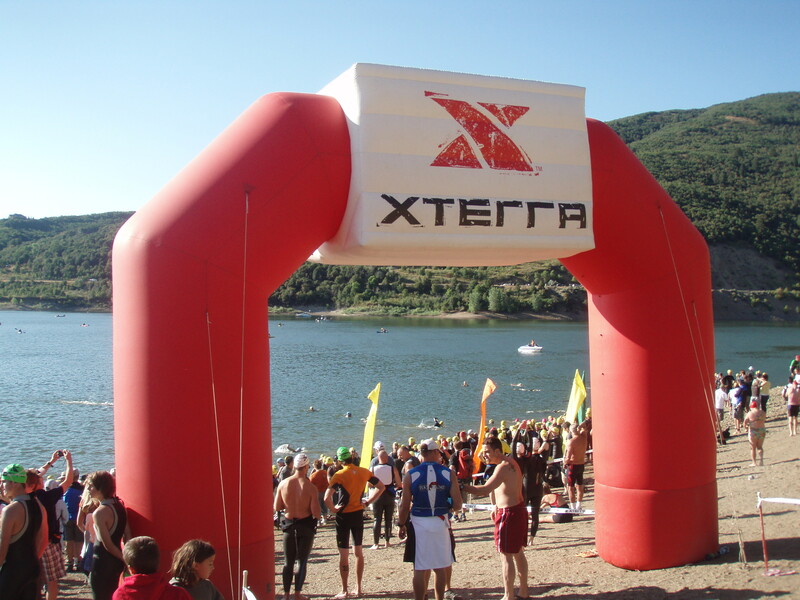 Jenny, an XTERRA veteran, was also racing on Saturday morning. We quickly unpacked the car and Juniper got reacquainted Micheal and Jenny’s kids: Jack (three weeks younger than Juniper) and Mikella (four). Unfortunately, we got to Ogden too late for me to pre-ride any of the course. That would catch up with me the next day. Saturday morning came early, but I was feeling pretty good. The first challenge of the day came up when race officials ruled the water in the reservoir was too warm for the pros to be allowed to wear wetsuits. As we know, I’m NOT a strong swimmer and I knew I would miss the extra flotation my XTERRA Wetsuit provides. Oh well. This was a much bigger race than Beaver Creek, with over 700 athletes competing and a deep field of pros that included both the reigning men’s and women’s world champions. My plan was to swim slow and steady and try not get run over. The first lap of the swim went pretty well and I found a nice pocket at the back of the pro group. The sport racers start and quickly catch me. But then, on the second lap, many of the sport racers, who started about 10 minutes after we did on the short course, caught up to me and slowed my pace. Standing on shore, Ian watched a twelve-year-old kid and a single leg amputee athlete (AWESOME!) get out the water before I did. However, I did manage to keep my freestyle stroke going for the whole swim this time and I finished about eight minutes behind the top pro women. From there, things got even tougher. I was now caught up with a lot of the amateur racers who swam faster than I did, but are slower than me on a bike. The ride started on a paved road but quickly funneled into a singletrack log jam. I passed hundreds of riders but eventually got to a point where I just couldn’t get around anyone else. I finally gave up and settled into the slower pace. Starting the bike leg behind lots of the amateurs and sport racers. Knowing that there was no way I could make up all that time, I tried to stay positive and have a fast transition and a decent run, which I did, finishing in 13th overall among the pro women. Conrad Stolz, the world champ, won the men’s race, while Melanie McQuaid won for the women. Jenny Tobin had a great race and finished in an impressive fifth place. Full race results here. Overall, the race at Snowbasin was a humbling experience for me, but I certainly learned a lot and I’m more motivated than ever to improve my swimming. But for now, my swimming will have to go on hold as I turn my focus to the Wulong Mountain Quest in China. Mike Kloser, Micheal Tobin, Josiah Middaugh and I are racing for Team Nike and we leave next Wednesday!